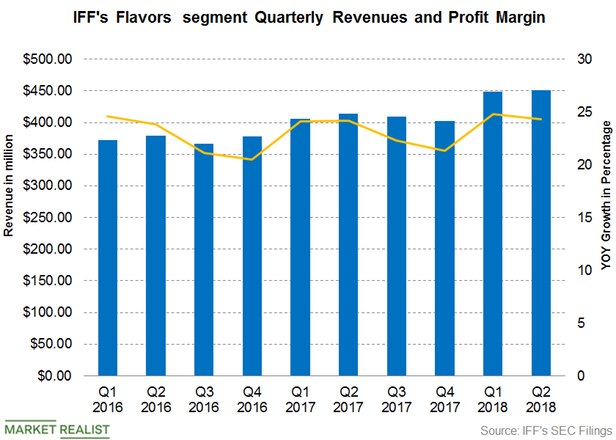 Home > Industry News > What Caused IFF's Flavors Segment's Margin to Expand in Q2 2018? What Caused IFF's Flavors Segment's Margin to Expand in Q2 2018? International Flavors & Fragrances’ (IFF) Flavors segment saw a fall in its contribution to the company’s overall revenue by 0.2 percentage points in the second quarter. The segment accounted for 49% of IFF’s revenue in the quarter compared to 49.2% in the second quarter of 2017. The Flavors segment reported revenue of $450.54 million in the second quarter, an increase of 8.7% on a YoY (year-over-year) basis. In the second quarter of 2017, the segment reported revenue of $414.3 million. The growth in the segment’s revenue was driven primarily by price increases and higher volume growth across all its categories and regions. North America led this growth at 9% driven by growth in the Tastepoint brand and new business wins in the beverage, dairy, and sweet categories. Latin American revenue rose 8% on higher demand in Argentina and Mexico. The EMEA (Europe, the Middle East, and Africa) region’s revenue rose 5%, while revenue in Asia rose 2%. The segment reported a net profit of $109.6 million in the second quarter, a rise of 13.2% YoY. In the second quarter, the segment reported a net profit of $96.8 million. The growth in the segment’s profit was driven by higher volume growth and benefits from productivity initiatives. As a result, the segment’s net profit margin expanded to 24.3% in the second quarter compared to 24.2% in the second quarter of 2017, implying a rise of 10 basis points on a YoY basis. The segment’s revenue could continue its growth trend driven by new business wins. Its profit and margin could continue to expand as a result of continued productivity initiatives.